When the 2012 documentary Titanic At 100 showed up on my door, I figured it’d be another basic retrospective look at the disaster. It came with an unusual subtitle, though: the DVD touts the program as “Mystery Solved!” “Mystery”? What mystery? Were there suspicions that Titanic sank for some reason other than the iceberg – like a second shooter on the grassy knoll? Curiosity mildly piqued, I dug into 100 to learn about this alleged mystery. The program follows the standard documentary template, as it mixes computer simulations, footage from the site of the sinking, and interviews. We hear from forensic investigator Parks Stephenson, RMS Titanic, Inc. president Chris Davino, NOAA Director of Maritime Heritage Dr. James Delgado, WHOI expedition leader Dr. David Gallo, artist/visual historian Ken Marschall, disaster investigator James R. Chiles, RMS Titanic, Inc, Director of Research Bill Sauder, WHOI principal investigator William Lange, ROV pilot Mark Heinrich, WHOI imaging director Evan Kovacs, Waitt Institute Director of Operations Michael Dessner, WHOI AUV technician Mark Dennett, WHOI AUV Operations Group Leader Gregory Packard, and RMST Inc. curator Alexandra Klingelhofer. The show delivers some basic Titanic history and posits the intentions of the expedition we follow: an attempt to visit unseen aspects of the wreckage and give us a complete map of the area. From this the participants hope to create a full reconstruction of the ship’s bits and pieces and solve a mystery. Yes, that “mystery” involved in the program’s title. It turns out the question here comes from the Titanic’s alleged “unsinkable” nature; the members of the expedition hope that their efforts will reveal whether or not some flaw in the boat’s construction led to its demise. I’m not sure if I should reveal the answer or not, as one could consider it a “spoiler” of sorts. However, as I think it’s an important part of this program’s success or failure, I’m going to get into it, so if you don’t want to know, just skip to the technical specs for the disc right now. Assuming I interpreted the documentary correctly, the solution to the “mystery” is essentially “wrong place at the wrong time”. Titanic didn’t sink because of a construction flaw or a bad rivet or excessive speed – it was a sturdy, well-constructed boat that entered into a battle with an iceberg that it couldn’t win. That’s it? That’s the big reveal? Granted, I wouldn’t want the documentary to fib and make the cause of the disaster to be something more dramatic just for show, but when I watched 86 minutes that lead me to believe there’d be a big reveal of some amazing revelation, this comes as a letdown. For 100 years, we’ve believed that a big iceberg fatally damaged the boat… and that’s what happened. Nothing new in terms of that issue arises here and it kind of leaves me with an “Al Capone’s vault” impression. 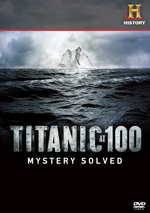 Leaving aside the lack of revelation at the end, does Titanic At 100 satisfy? Yeah, I guess. It’s more technical than most documentaries of this sort; while it does throw in some of the basics about people/events, it spends most of its time with computer simulations and glimpses/discussions of the wreckage. Which is fine, though I admit it doesn’t do a lot to engage me. I find myself interested in the human side of Titanic and not so fascinated by the details of the boat’s construction or the like. I take some value from these moments but find myself a bit bored with so much material of that sort. Especially since so much of Titanic At 100 feels like it exists just to pull us toward that big reveal at the end – the big reveal that simply tells us “the iceberg did it”. Is this a bad program? 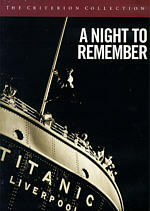 No – it offers a decent look at Titanic and throws into new data about the wreckage. 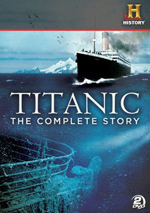 I suspect it’s of most value for the diehard Titanic buffs, though; it’s too technical for the average person, I think. 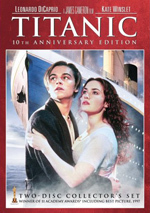 Titanic At 100 appears in an aspect ratio of approximately 1.78:1; the image has been enhanced for 16X9 televisions. This was a watchable but bland presentation. Sharpness usually seemed mediocre. The program consisted of a mix of on-site footage and modern “talking head” interviews. All of these tended to look somewhat rough and blocky, with many instances of jagged edges and shimmering. For instance, virtually every shot of eyeglasses suffered from prominent jaggies. I also noticed light edge haloes. Source flaws weren’t an issue, though some digital artifacts gave the show a bit of a grainy look. Colors were passable. The program featured a natural palette, and the hues looked okay, though they tended to be on the flat side. Blacks were fairly dark and tight, and low-light shots seemed reasonably distinctive. I didn’t think this was a poor presentation for SD-DVD, but it did look rougher than I’d like, even when I adjusted for the format’s limitations. I thought the Dolby Stereo 2.0 soundtrack of Titanic At 100 was perfectly acceptable. The soundfield had little going for it. Music showed decent stereo imaging, and a few effects spread out across the front. These were minor, though, and didn’t add much to the experience. That said, a documentary like this didn’t need a dynamic soundscape, so I didn’t mind the restrained presentation. If you want extras, tough luck! The program comes devoid of any bonus materials. Titanic At 100 promises some big new information about the famous ship, but it doesn’t really deliver. While it does offer fresh data, I don’t think these elements add much to the overall understanding of what happened. The DVD comes with mediocre to drab picture as well as decent audio; it lacks any supplements. This would be a good rental for Titanic buffs but doesn’t seem to boast a ton of general appeal.